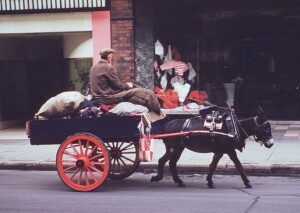 The Rag & Bone man was a once regular sight in Cabra as he went from road to road collecting rags, bottles and jamjars. Sometimes he would give a china cup and saucer for an old coat or a balloon on the end of a small bamboo with a feather stuck to it. This is the original way in which unwanted items were recyled.